This is a guest post by Bethany Gugliemino, a Museum Studies MA Student carrying out her placement with the UCL Teaching and Research Collections. Hello! In my last post, I told you a bit about my work with UCL’s magic lantern slide collection and shared some of my favourite slides. Today, I want to show you where you can see more of this collection and even help us identify some of the more mysterious content. As I’ve been cataloguing the slide collection over the last few months, I’ve created a separate list of slides that show an identifiable (or potentially identifiable) location somewhere on earth. This is a shorter list than you might think, since so many of the slides are lecture notes, graphs, and diagrams of scientific equipment. Working with this list, I’ve begun uploading images of these slides to the website Historypin. 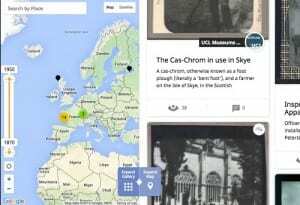 This site allows users to upload historic images and pin them to a specific location and to create collections and tours of different subjects. You can see UCL’s collection of images on Historypin here. Zoom in or out on the map on the left and adjust the date range to filter the slides that appear in the gallery on the right. This guest blog has been written by Kelsey Svaren, a placement student who has been working with us over the past few months. Hi, my name is Kelsey and I am current MA Museum Studies student here at UCL. As part of my program, I am required to undergo a placement where I work on a museum related project. I have spent the last month working closely with Nick Booth, curator of the Electrical Engineering Collections at UCL. 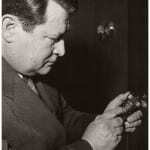 I have spent this time researching the numerous thermionic valves in the collection. Before I started my placement, I had a vague idea of what a thermionic valve is. I knew that it could be used in technologies, such as radios and telephones, to receive and amplify radio signals. Other than that, I was pretty clueless. Since I have started my placement, I have learned more about thermionic valves than I ever thought I would! One of Flemings original experimental valves. The thermionic valve is especially important to UCL, because it’s inventor, John Ambrose Fleming was a professor at UCL and helped to develop the Electrical Engineering Department that we see today. Dean Veall here, we are getting ready for tonight’s Focus on the Positive event where we will be giving away £2,000 to a researcher here at UCL. They will pitch to the audience their project who will then vote to decide which project, related to their research, becomes a reality. Alison Fairbrass was a runner-up at a previous event and has written about how she spent her £1,000 prize giving London Biodiversity a health check. Curt Herzstark and a remarkable machine. Today is International Holocaust Remembrance Day, and the 70th anniversary of the liberation of Auschwitz-Birkenau by Soviet soldiers. To mark this I thought I would discuss an object from UCL’s collections with a pretty remarkable story. This object not only saved the life of its inventor, but also allowed him to save the lives of others at Buchenwald Concentration Camp. 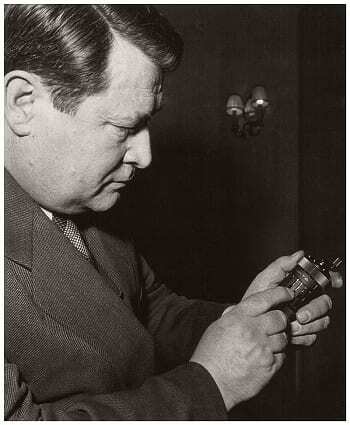 Curt Herzstark with one of his calculators. The Curta calculator is a wonderful machine. It’s was the world’s first handheld mechanical calculator and was used extensively from its invention until the digital calculator took over in the 1960s / 70s. Scientific American called it “the most ingenious calculating machine ever to grace an engineer’s hand” (£ link). Dean Veall here. This year we have given researchers from across UCL the chance to rummage through our drawers and delve into our cupboards as part of a brand new series of lunch time events, Show’n’Tell. The researchers had one task, to find just one object out of our 68,000 to show audiences and tell them all they know about it. Through these events we aimed to showcase the amazing research that is going on here at UCL and the passions driving some the people who work here. Some of the specimens chosen by researchers have directly related to their work whilst other have been a bit more left-field. As I get ready to host our last Show’n’Tell before the Summer break I thought it would be a good opportunity to look back on the specimens that we have had so far this year.